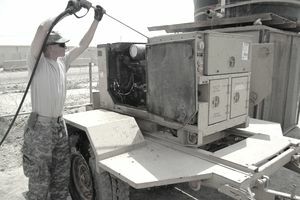 A U.S. Army Multichannel Transmission Systems Operator-Maintainer works directly on communication devices and equipment that communicate through more than one channel. They are responsible for installation, repair, operation, and maintenance check of these devices, antennae and associated equipment, according to the U.S. Army. Installs, operates, and performs unit level maintenance on multichannel line-of-site and tropospheric scatter communications systems, antennas, and associated equipment. Analyzes BIT/BITE diagnostics to isolate faults to the Line Replaceable Unit. Installs, operates, performs strapping, restrapping, preventive maintenance checks and services, and unit level maintenance on communication security devices. Operates and performs Preventive Maintenance Checks and Services on assigned vehicles. Installs, operates, and performs preventive maintenance checks and services on assigned power generators. Supervises operations and assists team members in the installation and operation of multichannel line-of-site and tropospheric scatter communications systems. Supervises, performs and assists team members in the performance of unit level maintenance on assigned communications equipment. Prepares input for statistical and other operational reports. Job training for a multichannel transmission systems operator-maintainer requires 10 weeks of Basic Combat Training and 15 weeks of Advanced Individual Training with on-the-job instruction. Part of this time is spent in the classroom and in the field. Operating multi-channel transmission equipment and diagnostic equipment. Performing maintenance on associated transmission vehicles. As your career continues, you will take more classes and training. Ability to apply electronic principles and concepts. Enjoys working on electronics and fiber optics. Interest in working with radios and transmissions. Ability to read, comprehend, and clearly enunciate English. Ability to work for extended periods in a confined area. Telecommunications Equipment Installers and Repairers, Except Line Installers. First-Line Supervisors/Managers of Mechanics, Installers, and Repairers. Compensation for this MOS includes housing, medical, food, special pay, as well as paid vacation. In the U.S. Army, qualified students can earn full-tuition, merit-based scholarships, allowances for books and fees, plus an annual stipend for living expenses. Those interested in this job may be eligible for civilian employment, after the Army, by enrolling in the Army PaYS program, which is a recruitment option that guarantees a job interview with military friendly employers. These company executives are looking for experience and trained Veterans to join their organizations.